Honda's touchscreen interface is incredibly frustrating to navigate; as a self-initiated project I analyzed the biggest pain points and designed low-fidelity wireframes to address these issues. In June 2016, I bought my beautiful red Honda Fit. Before this car, I had driven a 1994 Honda Accord (RIP), and a 1991 Toyota Corolla. Compared to the old cars, my new Honda Fit felt like I was in a spaceship. I purchased the version that came with luxuries I hadn’t had before like: push-to-start, keyless entry, a sunroof, and a 7” touchscreen display (which I was most excited for). Obviously I expected a learning curve transitioning from the early-nineties car analogue interface to the brand new touchscreen. But then again, I grew up with computers and was fully comfortable with touchscreens. However, something happened that I did not expect: I was frustrated doing simple tasks. I found myself frustrated with doing simple tasks on the touchscreen. But it was only a bad experience because I’m a designer and notice these things, right? Maybe. But I’d have to argue that it’s terrible for others because I’ve seen my passengers experience frustrations as well. Let’s say I was going through a drive-thru, or passed by a friend on the street and needed to turn down the volume right away, it was impossible due to not having a volume knob. My only options were the volume slider or the volume buttons on the steering wheel. Yes, there is a “mute” button, but I’ve never used it since it’s located on the volume slider and I avoid the slider like the plague. The mute button is good in theory but too hard to get to when looking for a speedy volume decrease. I find the volume slider really distracting to use while driving. I have to look where my hand is at, compared to a knob where your hand is in one place. I’m not alone on this. Other people agree. My second biggest frustration is the bluetooth device list. When I get in the car, I’m really only thinking about one thing: getting to my destination. I don’t want to spend any extra time before driving to get situated.Whenever I go to this screen I am almost always already driving. So if the user is driving, why are these buttons very thin with hardly any space between them? I can’t even tell you how many times I’ve hit the wrong button (AKA serious frustration). Also to note, all of the buttons look exactly the same so I can’t recognize them upon quick glances. Additionally, I can’t figure out how to arrange the list or delete old devices; which is why you see two “Summer’s iPhone” buttons. I wouldn’t be much of a UX designer if I didn’t offer solutions to these problems. I’ve come up with some simple ideas Honda can implement. Retire the volume slider. Bring back the knob! This is an easy solution and self-explanatory. Bringing back the knob would provide less distraction and ensure fast volume decreases. It looks like Honda got rid of the volume slider on the 2017 Honda CRV, but has yet to implement across the rest of the fleet. I’d say it’s safe to assume that they will bring back the knob due to drivers voicing their dislike for the slider. Yay! 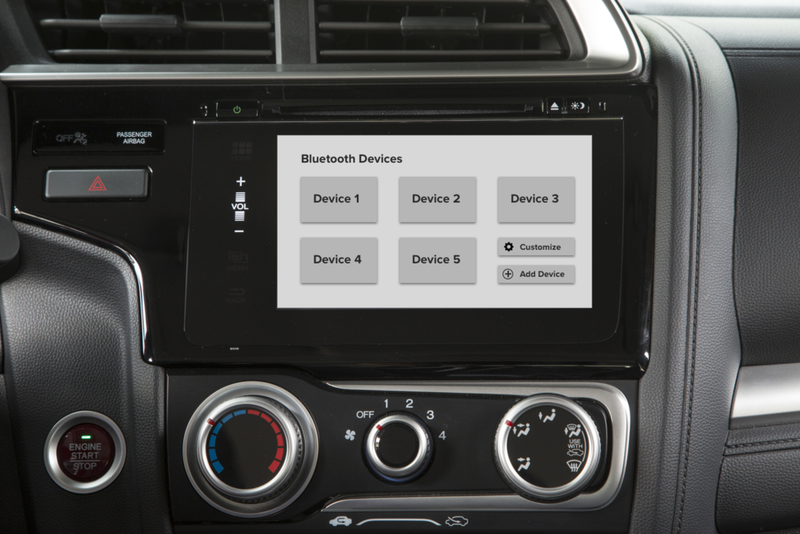 The Bluetooth device list can be more user friendly by a redesign focused on ease of use while driving. This means that the buttons need to be read at a fast glance and pressed easily when driving at high speeds or over bumps. To ensure that the buttons are easy to press while driving, I suggest making the buttons large and more of a square format. The buttons right now are designed skinny and horizontal, but why? The right side of the button has icons that I’ve never once glanced at for feedback, aka not necessary in my opinion. In addition to making the buttons larger, there also needs to be more padding in between each button to avoid hitting the wrong device. To help the driver comprehend the list at a glance, I suggest being able to personalize the list. Providing some colors or images to customize would help with fast recognition. Also, being able to re-order the list by dragging and dropping would help the driver organize the list according to their preferences; which would help with speed of selection and lead to less distraction.